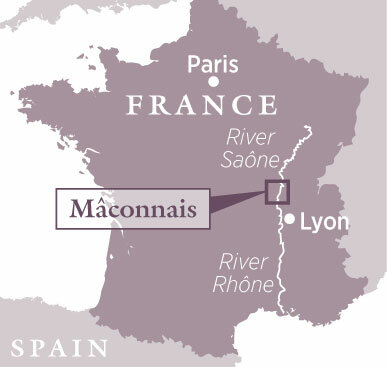 The Macconais region of southern Burgundy tends, at worst, to get overlooked or, at best, tacked onto the better-known bits of Burgundy, such as the Côte d’Or to the north or Beaujolais to the south. It deserves better. Barely 50km from top to bottom and 15km wide, it’s a land of rolling, vine-clad hills, sunny valleys and distant views of Mont Blanc, and its compact size makes it ideal for a short break. The climate here is warmer than in Burgundy’s more northerly parts – you feel the difference arriving from the north when you catch the first glimpses of the broad, fertile Saône Valley. The architecture starts to hint at the Mediterranean – flattened roofs with rounded Provençal tiles replace the steep slate or glazed-tile coverings of further north. Pavement cafés pop up in summer along the Saône, which marks the region’s border with Bresse, and the towpath between Tournus and Mâcon (renamed La Voie Bleue) teems with cyclists, rollerbladers, horse riders and hikers. Best of all, because the Mâconnais vineyards are still something of a well-kept secret, the region feels like real France. You won’t find pompous hotels, stiff restaurants, organised cellar tours or train rides through the vineyards; what you are assured of is a good range of welcoming country hotels and B&Bs, restaurants serving the kind of food you feared France had turned its back on, and a willingness from growers to show you their wines and to talk about their region. And there’s a lot to talk about. There’s still a huge cooperative presence here, but the story is increasingly one of independent, small-scale, highly motivated vignerons dedicated to making distinctive whites (plus tiny quantities of red) at seductive prices. Some growers have wrested family holdings back from the co-ops, while others have started from scratch. A significant number (including Bret Brothers, Barraud and Pascal Pauget, see box above) are members of the loose association of Les Artisans Vignerons de Bourgogne du Sud, founded in 2004 with the aim – to quote Corinne Merlin of La Roche Vineuse – ‘of confronting the power of the cooperatives, to show them we’re here too’. Their objectives are to make the most of the top terroirs in their possession, to nurture the soil (some, but not all, farm organically), to harvest grapes manually, and to keep their domaines to a manageable size. When you arrive on the Route des Vins, starting in the north, the first town of any size is Tournus, on the banks of the Saône. Well worth a detour, its cobbled streets are thronged in summer with visitors to the magnificent Romanesque abbey, shoppers wielding baskets at the Saturday morning farmers’ market and browsers in the many antiques shops. From here, the Route des Vins du Mâconnais wanders gently along a series of broad valleys flanked by rolling hills, vine-clad slopes and meadows grazed by Charolais cattle. Here viticulture sits peaceably with agriculture. Huddled in hollows are neatly tended stone villages with suitably vinous names (Chardonnay, La Roche Vineuse), many with fine Romanesque churches. A little sidestep off the Route des Vins takes you to Cluny, where the Benedictine Order was born. The French Revolution dealt a devastating blow to the monasteries and little remains of the original 10th-century Cluny Abbey and its subsequent embellishments, but the museum gives a vivid sense of the scope and power of the Cluniac order. Further south you can hook up with the Circuit Lamartine, a beautiful, elliptical route which starts in Mâcon, birthplace of the famous Romantic poet Alphonse de Lamartine, and proceeds through Monceau and Milly-Lamartine, where he spent much of his childhood, to the high point of the Château of Berzé-le-Châtel, surrounded by a sea of vineyards. 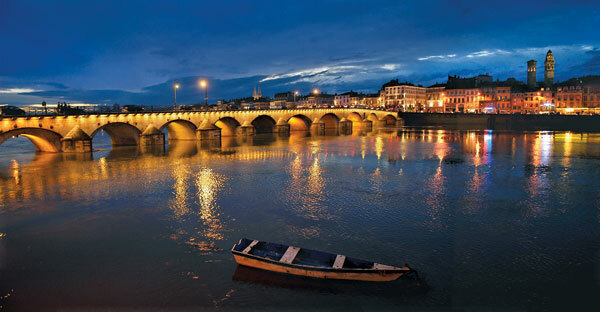 From here you catch glimpses of the Mâconnais as seen through the eyes of the poet. Mâcon itself, with its traffic-free old town, has a terrific Saturday market by the St-Laurent bridge straddling the Saône. Further south the craggy outcrops of Solutré and Vergisson, at whose feet the celebrated Pouilly-Fuissé is grown, signal the end of the road and the beginning of Beaujolais country. As you plan purchases the two appellations that open the door to the region are, first, Mâcon, some of it white but the majority Gamay-based red and rosé. And second, generic Mâcon-Villages, for which only Chardonnay is permitted. Neither should be scorned, particularly those from the top domaines; both offer lip-smacking Burgundy quality and solid value for money (Cave Talmard in Uchizy and Jacques and Nathalie Saumaize in Vergisson are exemplary). Look out for them, offered as jug wines in bistros, such as the excellent Le Carafé in Mâcon. Then come the wines that are permitted to tack their village name onto the label – think Mâcon- Chardonnay (the village), Mâcon-Lugny and Mâcon-Chaintré. Finally there are the region’s five ACs: the famous Pouilly-Fuissé and its lesser-known siblings Pouilly-Vinzelles and Pouilly-Loché, plus St-Véran and Viré-Clessé. By car: on A6 motorway, exit Tournus or Mâcon. By TGV: to Mâcon-Loché, from London St Pancras or Ashford International via Lille or Paris, about 6 hours. By plane: to Lyon, about 1.5 hours flying time from major UK airports.